In a small bowl, whisk together 3 tablespoons oil, lime juice, vinegar, honey, soy sauce and sriracha. In a large saucepan of salted boiling water, cook broccoli until tender, 2 minutes. Using a slotted spoon, transfer to a colander; drain and chop. Add noodles to water and cook until al dente, 8 minutes; drain. 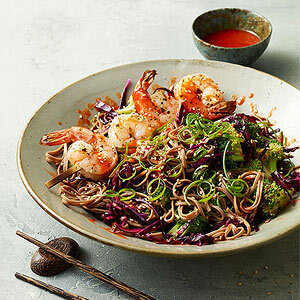 Return noodles to pot and toss with broccoli, cabbage, scallions and half the sauce. Heat the broiler. In a large bowl, toss shrimp with garlic and remaining oil. Season with salt and pepper. Thread shrimp onto four skewers and broil until just pink, 2 to 3 minutes. Divide noodles among four bowls and top each with a shrimp skewer. Sprinkle with scallions and sesame seeds, if using, and drizzle with remaining sauce.